Sending a very special birthday wish to my friend Heather! Had so much fun roaming around Napa and Sonoma with you! This dress is stunning on you...love it! Gorgeous floral piece, you look super charming with that hat too! Such a beautiful dress to wear on such a lovely day! Um, this is so adorable! One of my favorite outfits in a while, but it makes me very anxious for some warm weather! Love everything about this outfit. The swingy dress, the floral, the bag, the hat, the shoes! this is a diff look for you. I like it. Oh how pretty and springy??? I love it! That flowy dress and accessories go perfect together. I can't wait to go to Napa Valley when we move back to the states. Right now we literally live in wine country (Italy)...lol. Such a beautiful dress, I like it so much! Such an amazing outfit and perfect for the occasion! so sweet! sounds like a fun weekend and i love this swingy dress! gorgeous photos Krystal. Wish I was in wine country! wow very cool dress! Never heard of them before! what a fun dress! very cute look! What a fun dress - perfect for wine country! LOVE the dress & hat! This is such a beautiful floral! You look stunning! oh my god, this is the most perfect summer dress! i saw your pics on instagram and it looks like you had a great time- happy birthday to your friend heather! I love the silhouette of this, a classic take on the tent dress. You look stunning! Wine country is the best! 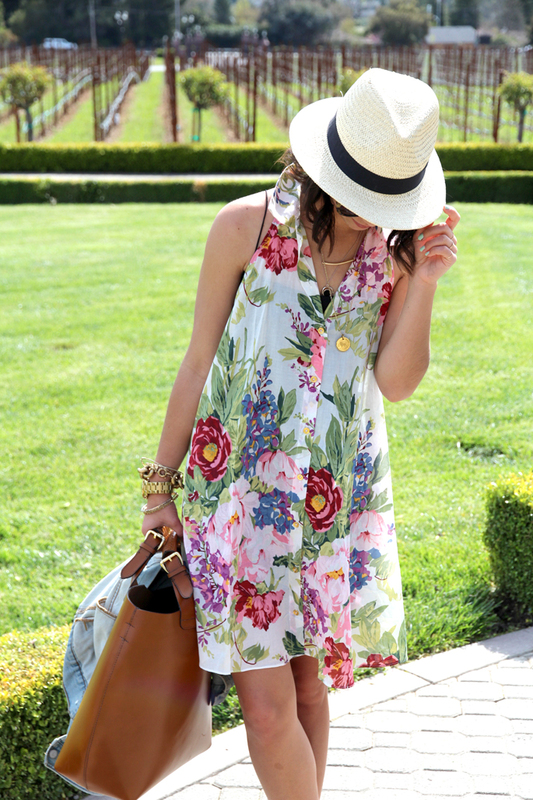 Love this look too...the dress and the hat are perfect for a day of sipping wine and frolicking in vineyards! Absolutely lovely! The dress is amazing, feminine and coquette! Love the floral and the billowy feel of the fabric. Love wine tasting in Napa/Sonoma! Beautiful photos! The perfect look for spring. Love it! What a perfect look for a wine country weekend, Krystal. I love that dress... the print is gorgeous. Gorgeous. What a wonderful dress. This dress is so fun & pretty. You wear it well! Great photos! Your dress is lovely! I am obsessed with your bag! It's amazing! Please follow me and enter my giveaway! This purse is envy-inducing. I am beyond in love with it. The leather looks butter smooth,and it's the perfect color of cognac. Beautiful pattern, epitome of spring chic. This dress is incredible & paired with that Panama hat it has me lusting for vacation. Hope you enjoyed your time in wine country! OMGosh!!! Love your dress!!! The floral prints are unique. Gorgeous outfit....you look super cute!!! 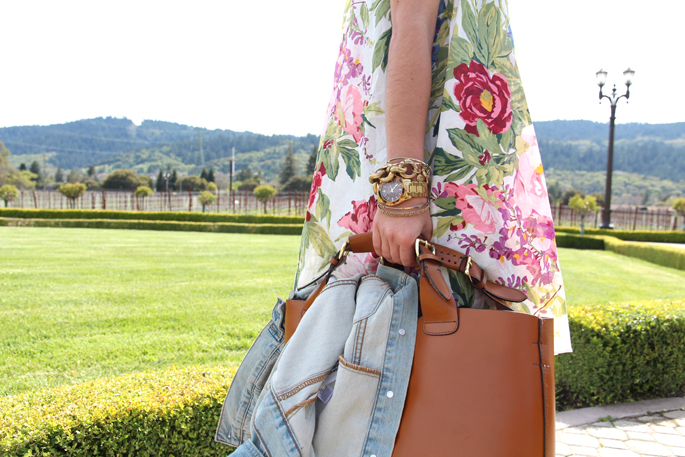 Love the dress flowers with the combination of the camel bag! You are so pretty! I love the flow and roominess of that dress! Great shirt dress. It looks fantastic on you. Perfect for summer.